Educatall team suggests an imaginary game to enjoy with your group. (Open thematic letter - The ocean) Print the letter. Slide it in a bottle and drop it in a large bin filled with water which represents the ocean. Leave the bin out for children to notice. Invite a different child to retrieve the message in a bottle each day and read a portion of the letter for the group. Follow the instructions. Prepare a special corner which includes several blankets, towels, a table, chairs, and clothespins children may use to create their own boats. Use a very large piece of cardboard (appliance box) to cut out the outline of a pirate ship. Hang it on a wall. Encourage children to decorate the boat throughout the theme. Use fabric for the sails, empty paper towel rolls for the masts, etc. We have prepared crew members. (Open craft - crew pirate ship) Print and have children color them. They will love adding them to their ship. The pictures may be used as a memory game or to spark a conversation with your group. Use them to decorate your daycare or a thematic corner. 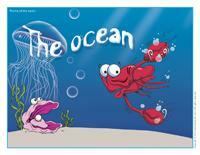 (Open picture game - The ocean) Print, laminate, and store in a "Ziploc" bag or in your thematic bin. 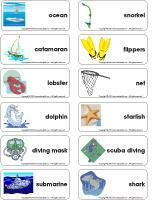 (Open writing activities - O like Ocean) Print for each child or laminate for use with a dry-erase marker. 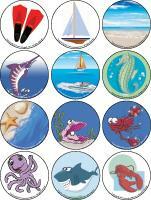 (Open activity sheets - The ocean) Activity sheets are suggested for each theme. Print and follow instructions. Leave only blue, brown, and green blocks in your area. They can represent the water, the beach, and seaweed. Characters or animals related to the ocean. Cover the floor with a large piece of blue plastic to represent water. Have children wear mittens while they are playing with the blocks... tell them their hands are like a crab's claws and have them notice how difficult it is to grasp the blocks. Add salt to your poster paint and admire the result once dry. You may use fine salt, sea salt, or coarse salt to experiment with different textures. Add fine sand or white glue to your poster paint. Use chalk to draw on sandpaper. Add paper tentacles to a paper plate to create an octopus. Blue, green, and brown tissue paper, construction paper, and cellophane paper. Collective ocean craft. Collage, cutting, poster paint, glue/sand, etc. Use Popsicle sticks to make ocean creature puppets. Materials to make your own fishing rods. Creative coloring activity related to the theme. At the beach: sun hats, beach towels, sunglasses, umbrellas, sandals, sand toys, beach chairs, empty sunscreen bottles, magazines, etc. Deep sea fishing or crab fishing: rubber boots, raincoat, fishing rods, bait, hats, fishing tackle, fishing net, plastic fish, etc. 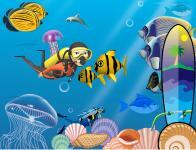 Scuba diving: mask, snorkel, flippers, beach towels, bathing suits, oxygen tanks (2 litre soda bottles), anchor, etc. You can use blue and green electrical tape to delimit your area and represent water and the banks. Memory game involving marine animals. Homemade or store-bought puzzles with beach or ocean scenes. Magical seashells: hide a marble under one of three seashells (or plastic glasses). Move them around. Children follow the seashell hiding the marble with their eyes and then take turns lifting the seashells to find the marble. Find crab, octopus, and dolphin illustrations. Laminate them and cut them to make original puzzles. Provide tongue depressors and pompons (or ping-pong balls). Children use the tongue depressors like crab claws to deposit the pompons in a container. Play pin the tail on the dolphin or whale. Transparent bottles filled with different shades of blue water. Ziploc bags filled with blue hair gel, blue salt, blue oil, etc. Be sure to close the bags well and seal them with hot glue. Children love manipulating the bags and watching the changes...without getting dirty! Marine animals can be made out of modeling dough. Books related to the theme. Provide headphones and CDs with the sound of waves. Children will love listening to the ocean! Picture books about fish and marine animals. Finding Nemo book and CD set. Children can use the educatall.com picture game to invent stories of their own. A cookie sheet filled with sand and a stick. Children can write words or draw in the sand. Laminated fish illustrations. Children can use dry-erase markers to draw along the lines. An obstacle course through which children must move like crabs, sea turtles, or lobsters. Attach a cushion to each child's back. Have them crawl around like sea turtles or hermit crabs. Divide your group into two teams and have a race. Bowling game: Use approximately 10 empty soda bottles. Glue a marine animal illustration to each bottle. Treasure hunt: Use ten pairs of fish. Have children find the matching fish. I am moving like a... (name a marine animal). This activity is great for transitions. Sand table with beach toys which can be used to make sand castles, dig tunnels, etc. Container filled with ribbon, yarn, and string in every shade of blue along with tiny fish or seashells. Make magnetic fishing rods. Fish for various objects. You may also fill a bin with gooey blue substances (Jell-O, blue baby oil, etc.) Let children manipulate the content of the bin using a variety of containers, kitchen utensils, or plastic marine animals. This activity can be somewhat messy but children love it! Make your own wave machines! Ask each child to bring an empty 2-litre bottle. Add ½ cup of vegetable oil to each bottle. Fill them with water and add a few drops of food coloring. Seal the caps and let children shake their bottle to make waves. Several different sizes and shapes of seashells along with magnifying glasses. A live crab or hermit crab for children to observe up close... if you can't bring a live one, find illustrations. Pictures of sea turtles and land turtles for children to compare. Use blue cellophane paper to see how marine animals see the world. What does seawater taste like? Sardines...to eat or just for observation! (Open picture clue story - The ocean) Print. Sit in a circle with your group. Begin reading the story. When you reach a picture clue pause and point to the illustration. Encourage children to guess the missing word. Have children sit in a circle. Give them each the name of a marine animal (shark, whale, crab, lobster, starfish, etc.) Stand in the centre of the circle. Throw a scarf up in the air and say, "In the ocean there are..." Name a marine animal. The child who represents the marine animal must catch the scarf and throw it in the air while naming a different marine animal. Select a child to be the shark. The shark chases the other children until he touches one of his friends. That child becomes the shark. Variation: The child who is touched by the shark must remain still and stretch out his arms. Another child can save him by running under his arms. You will have to change sharks often! Divide your group into two teams. Have them sit so they are facing each other. Have one group name large marine animals with a big, loud voice while the other group names small marine animals with a soft, quiet voice. Sit in a circle with your group. Show them that port side is to the left and starboard side is to the right. Ask children to touch the child sitting on their port side, then starboard side. Once they have grasped the concept, set cones on the port side and on the starboard side. One child stands in the center. Shout out, "Port side to starboard side!" (or the opposite). Children much change sides without the child in the centre touching them. If a child is touched, he replaces the child in the middle. Children sit in a circle. Player #1 walks around the circle, touching the other children and saying "Whale, whale, whale..." When he says "shark", the player who was touched (Player #2) must stand up and run after Player #1. Player #2 must touch Player #1 before he reaches his spot. If Player #1 reaches Player #2's spot before being touched, it's Player #2's turn to walk around the circle. If the opposite occurs, Player #1 starts all over again. Using masking tape, draw two parallel lines on the floor. Set small aluminum plates filled with water between the two lines. Children must cross over to the other side without touching the water. If a child touches the water, the other children must shout, "Man overboard!" Deposit three hula hoops on the floor, in a row (or trace three circles using a rope). Children stand in a circle around the hula hoops. They take turns hopping in the hula hoops to the sound of music. When the music stops, if a child is standing inside a hula hoop, he is trapped like a crab in a cage. He can mime a crab moving its claws. Repeat. Deposit a large recycling bin filled with water near your daycare entrance. Ask parents to write a message for their child. Have them slide it in a plastic 2-litre soda bottle. When they are done, they can place their bottle in the water. At the end of the theme, have children pick a bottle and discover the messages together. (Open bingo - The ocean) Print and laminate. Play bingo with your group. (Open snakes and ladders - The ocean) Print and laminate. Use a die and tiny plastic fish as playing pieces. (Open association game - The ocean) Print and laminate. Children must determine if the fish live in the ocean or an aquarium and glue them in the correct place. (Open Hunt and seek - The ocean) Print and laminate. Children pick cards and search for the items in the picture. (Open lacing - The ocean) Print, cut out, and laminate. Encourage children to lace the various shapes. (Open story and memory game - The ocean) Print, cut out, and laminate. Place the cards face down on the floor. Invite children to pick three cards and invent a story related to the illustrations. To solidify the cards, glue them to the top of frozen juice cans. Glue four pieces of dark blue felt onto a large piece of cardboard. Display your felt board on the wall. (Open felt board game - Ocean) Print. Trace the shapes on different colors of felt and cut them out. Older children can help you. The shapes will stick to your felt board. Create new shapes depending on the season or theme. Relax to the sound of waves. Make gently waves with your arms, use your mouth to make a wind sound, gently rock from one side to the other, let yourself be carried by the water, etc. Arrange several containers filled with water on a table. Provide various ingredients such as salt, sugar, pepper, spices, sand, dirt, and flour. Let children experiment. Have them add a small quantity to a container and watch to see if their addition dissolves or not. This is the perfect activity for a warm, sunny day. Prepare several items making sure to have some which float and some which sink. Children will enjoy making predictions as to whether they will float or sink. Why do we float in the ocean? Globule has prepared an experiment for you and your group. Let children plunge their hands in a bin filled with blue Jell-O. Add marine objects to the bottom of the container. Children may also use a net to catch the objects. (Open craft-Octopus) Print for each child. Have them color the various parts and glue them on an empty toilet paper roll they previously painted black. (Open craft-Crab) Print for each child. Have them color the various parts and glue them on an empty toilet paper roll they previously painted red. (Open craft-Lobster) Print for each child and have them color the various parts. Glue the pieces on construction paper to make them stronger. Cut them out. Use fasteners to assemble the lobster so that it can move its claws. Give each child a piece of thick paper. Ask them to draw fish, seashells, seaweed, etc. using waxed crayons. Next, have them paint over their entire paper with blue poster paint (to represent water). Their drawings will not disappear because the paint will not adhere to the waxed crayon. Their drawings will appear to be at the bottom of the ocean! Have children paint banana split containers. Add a drinking straw to represent the mast, fabric or construction paper to represent the sail, etc. Use materials such as corks and pipe cleaners to create benches, oars, etc. Use coffee sticks to make a raft. Paint and decorate it. You can even try to make it float. Organize races in a water table or in a kiddie pool. (Open Craft-Marine life mobile) Print. Use the shapes as models and trace them onto heavy cardboard. Cut out the shapes and decorate them with fun foam, Styrofoam, corrugated cardboard, etc. Make a small hole at the top of each shape and thread fishing wire, string, or wool through it. Be sure to use different lengths. Hang the shapes from wooden skewers (cut the ends) and hang your mobile! Collect containers with caps (empty water bottles, soda bottles, etc.). Add 2 cups of water and a few drops of blue food coloring to each container and mix. Add ½ cup of vegetable oil. The oil will rise to the surface. Add a fish, a plastic boat, or any other tiny object which represents marine life. Seal the cap with hot glue. Gently, place the containers on their side and make waves. The objects will drift at the surface. Have children trace the outline of a drawing using a pencil. Have them fill their drawing with glue and add seashells. (Open creative coloring - The ocean) Print for each child. Have children draw what they see at the bottom of the ocean. 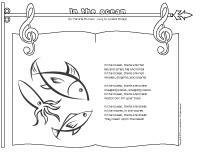 (Open coloring pages theme - The ocean) Print for each child.